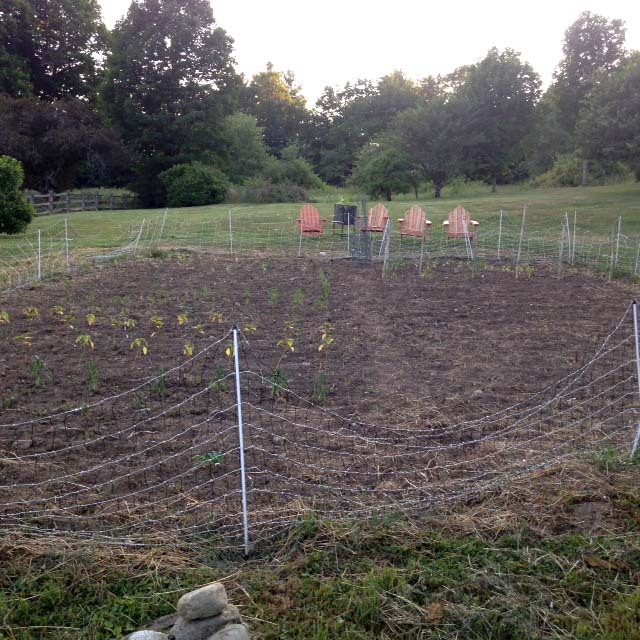 I got my garden in - except for 4 rows of sunflowers which I am holding back on so I have a long season of bloom in September and October. Next I have to mulch it all with cardboard and old hay. We are so desperate for rain and I hope it comes soon. 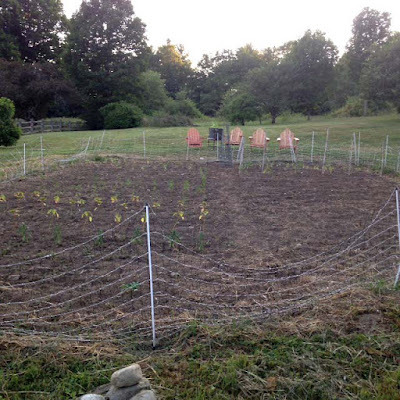 I can't water my garden because we don't have enough water to do both gardening and living. It is sink or swim for the plants. That is why mulch helps so much. This past year, Julia took Woodshop at school. She loved it! I am so happy she has found something she likes to do with her hands - even if there are power tools involved. The last project they did was a joint project with the entire class. 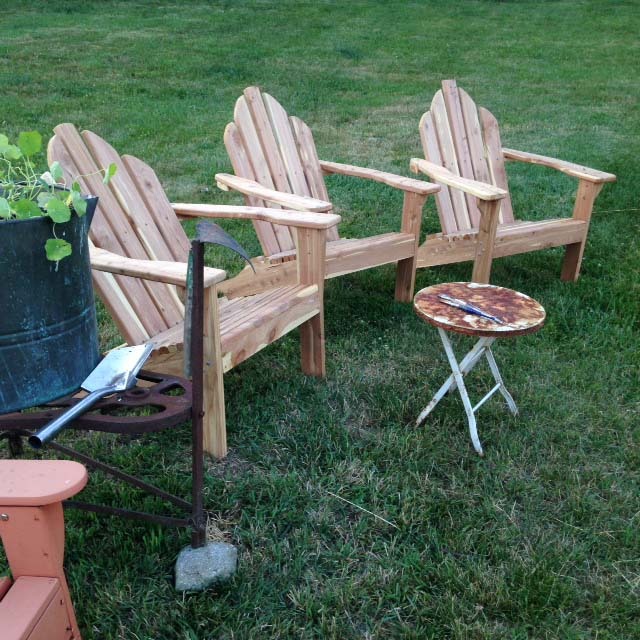 They made Adirondack chairs - each student contributing to the project with the skill they did best. Evidently Julia is an awesome sander. They offer the chairs to student's families at the cost of the materials. We put our order in. It took three trips to the school to get them. They are huge! Made of cedar, we are contemplating staining them. Julia doesn't think I should but you know me! Thank you Mr. P and Ruth for inspiring Julia to work with her hands. 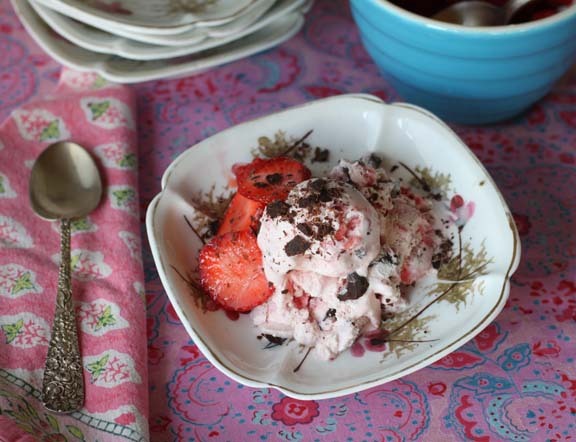 This past weekend we made some delicious and easy strawberry ice cream. Recipe here in my archives (thanks Joanne for the reminder!). Well done Julia, those chairs look amazing. Do let your mum stain them as she will only improve what is already a great product, and they will last longer. Shame I can't send you some of our rain. This is the wettest summer we've had in ages, here on the South coast of England. I cannot cut my grass as it is too wet, and is growing like crazy. And proper "sanding", strangely enough, is actually more difficult than you would think... BAD sanding can quickly ruin a "restoration". Anyhoo, I'm glad she took the Class, as it'll give her the basics of other "skills" as well! A lot of MATH and ENGINEERING are also involved, along with DESIGN and the whole "tactile" thing... AND, it's something that can all be done withOUT "power tools" if need be! hmm... I guess a proper "TOOL BELT" will be on the SANTA List this year, eh? - Or, a Membership into the "ELF-UNION"! whatever. GREAT looking CHAIRS! - They'll likely get RAINED on tonight! The chairs are beautiful! If Julia agrees I think you should paint each one a different bright color. I saw some done this way in a magazine or someplace and they were so bright and happy looking chairs. The chairs are beautiful, as everyone commented. I save my shower water to water the flowers. We don't have a shortage in Chicago but our condo assoc pays a hefty water bill and I don't want my neighbors to pay the cost of my garden. I just put the plug in the bathtub when the garden is dry and carry the water over the alley (a couple cat litter jugs). It's a bit of work but gratifying that the water is used twice. I'm thinking of a way to use my laundry rinse water as well (after certain loads). Enjoy the blog!